Are there still any travel agencies open in Boracay to book Airasia and Cebu Pacific tickets? Suggestion of Land reform in Boracay What are our thoughts? Hi! I’m looking for recommendations for builders/contractors in Boracay. Thanks! Guys, anyone know exactly the day of island opening🏝? 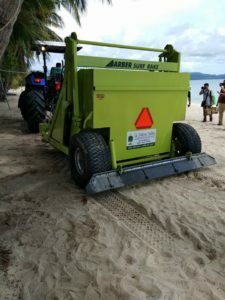 Beach Cleaning Machine deployed in Boracay, would this be useful for maintenance of safe and clean beach sand? Hi. Good day po! Any hotels in Boracay still open for weddings this September? What are the requirements for beach wedding in Boracay? I need Pastor/Priest to advise me on the requirements for beach wedding in Boracay. Where can I get some succulents in Boracay? What are the van companies in Boracay that do airport transfers? Hi! What are the van companies in boracay that do airport transfers? Our company is currently looking for one to partner with. Kindly comment here if you have companies to recommend. Thanks! Do you know a good photographer in Boracay? Hi guys, does anyone knows any photographer who will be in Boracay on June 30. We need one official photographer for an afternoon event in the island. If you know anyone please recommend one to me. Thanks!